It’s so nice to see these blooms and ‘will be blooms’ during the bleak days of winter. The month is half over already, and as many of you probably do, I also count down the days until spring. 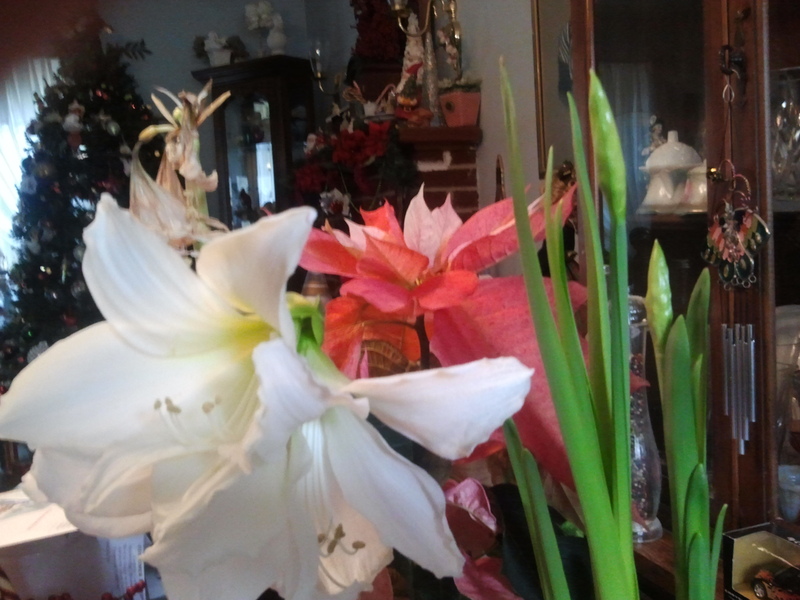 The white Amaryllis has been blooming since Christmas! (This is the second stalk). The poinsettia came from the same place as the paperwhites-Terrain. They are about to bloom. I have them in a aluminum pie dish with sea glass in it. The tree came down yesterday and I still have some the boxes in the living room. I have major tidying to do in the basement, but will need help with the lifting and stacking part. I’ve been having lower back issues (on the right) that I feel is from standing so long and vacuuming for 45+ minutes-all the pushing and pulling. Certain things are aggravating it, so I have to be careful. Then my right eye is really red in the corner. I called the doctor’s office yesterday and she called an antibiotic drop in for me. I can’t tell you the last time that happened (not having to go in for a visit-but I will if it gets worse)! I have to use it for a week and it’s still a bit red, but it was weepy and filmy Tuesday night. I’m going to start my new year of dental repair on Tuesday. It’s going to be quite pricey and they said we could space out the visits. The first visit will be two crowns on the bottom and a filling. I have an older crown on top where the tooth underneath has a cavity. I hadn’t had my teeth cleaned for over a year, but went there 5 times last year. This time they did bitewing x-rays and the very thorough dental hygienist found all my issues. She was kind of rough, but surprisingly my mouth only was sensitive in a few spots. I can never seem to be debt free with the dentist. Of course I need to get down to doing the crafts I love which I haven’t lately. Everything is gathering dust. I have some ideas up my sleeve and I also have some new yarn for crochet (and new stitches to try thanks to Pinterest). pretty blooms. My amaryllis has never grown beyond one-inch leaves. I wonder if there is still hope??? it has been almost two months. Glad you are enjoying your new toy. A NY trip sounds like fun, though I would never ever attempt to drive in that city!! Your flowers are so gorgeous and yes, I’m counting the days until Spring as well! lol Although our snow has come in late, it’s now making up for it, it’s been snowing all day here today. Taking down the Christmas tree and all the decorations just isn’t as much fun as putting it up, is it:-) Hopefully your back and eye won’t give you too many more problems. A trip to New York to look forward to is sure to brighten up the spirits:-) I’d love to go there one day, Steve needs to take a month off work so that we can travel in the States! lol As it is, he works 6 days a week (midnight shift) and has to take a day off whenever we want to go away for a weekend.